TODAY is International Surf Day! Grab your boards, dudes and dudettes. Oh, the surf is a dud today, dude...typical for summer in the Gulf. Well, to make up for it, here's a pic of the beach where I grew up. 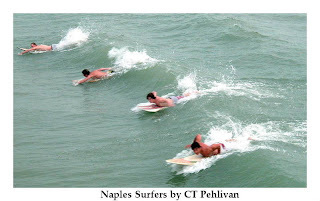 Looks like the south side of Naples Pier, a break I rode many a time -- small (OK, tiny!) waves but one takes what one can get in SW Florida. I knew some of the guys in this photo but can't recall any names now. Oh btw, it is the day of the winter solstice here, the year's shortest day. It aint half cold here too. Winter in Tassy. It would brrr your buns off!